In my last post I shared the menu and photos from my Olympics party celebrating the 2018 Winter Olympics in PyeongChang. 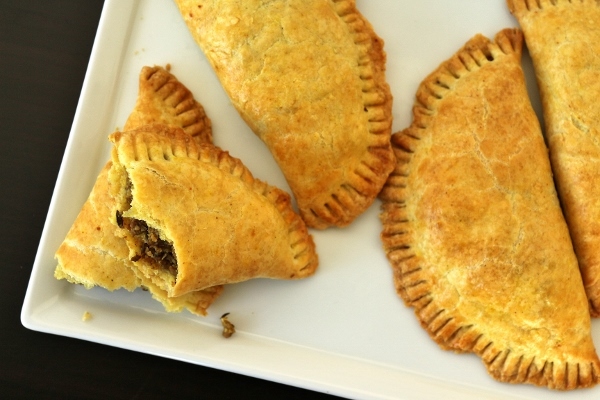 Today I'm sharing another recipe from our shindig, the Jamaican Beef Patties, representing the island nation of Jamaica. I'd like to preface this by once again letting you all know how much I absolutely LOVE Cool Runnings. I've loved this movie for ages, and I love that it's based on a true story, although I know the movie isn't completely true to the original story. Although it would make more sense to make Jamaican dishes for the Summer Olympic Games because Jamaica has a much larger presence in summer sports, I'd prefer to celebrate them and their bobsled team in the winter. The filling for these patties is very tasty, but not too spicy. I used a single Habanero chile, which I seeded, but if you want a spicier filling, you can leave the seeds in, or use more chiles. Other traditional Jamaican ingredients include curry powder and allspice. 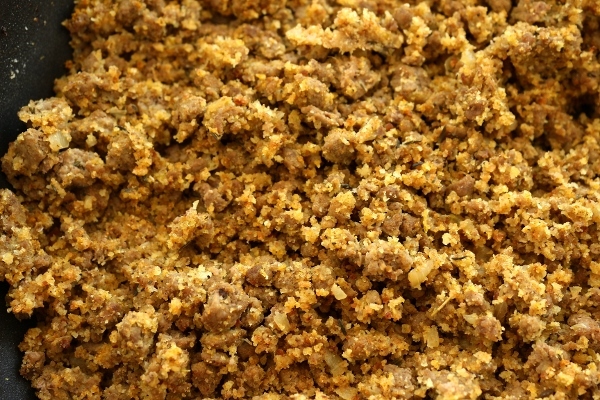 Breadcrumbs help to bind the filling. 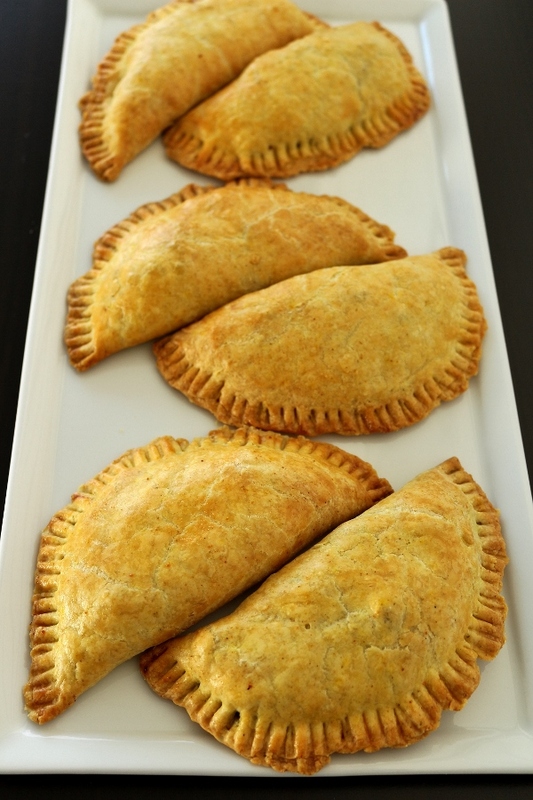 Curry powder finds its way into the crust as well, giving the flaky dough a golden hue. It's basically the same method as making pie crust, so if you feel comfortable making pie, this isn't much of a stretch. 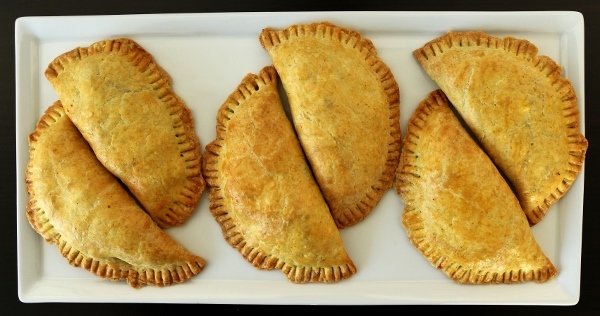 A lot of Jamaican Beef Patty recipes have you roll out the dough and cut out circles, but I feel like this is wasting so much of the dough. Instead, I divided up my dough into balls, and rolled each ball out into circles. 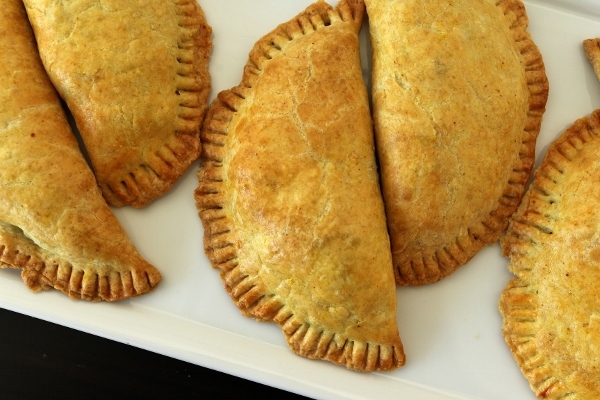 No, the circles weren't as perfectly round as if I had cut them out with a round cutter, but many cultures make empanadas using this same method, and the results are delicious and only slightly more rustic than the alternative. These patties were awesome! My friend Camille's almost-two-year-old daughter loved them. The adults loved them. I made them a week ahead of time and froze them so I could save some time the day of the party. I simply thawed them in the fridge and reheated them in the oven before the guests arrived. To make the filling, heat the oil in a large, preferably nonstick skillet over medium-high heat. 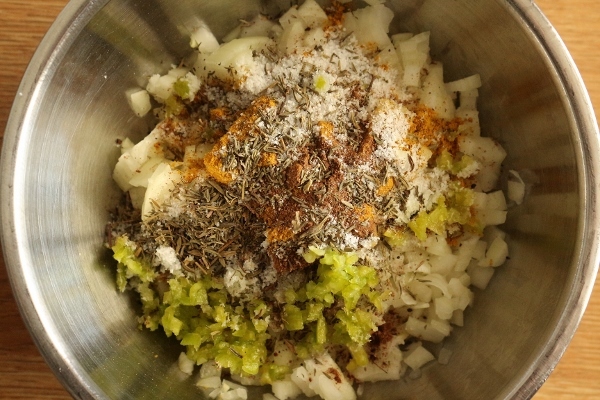 Add the onion, garlic, chile, curry powder, salt, thyme, and allspice, and cook for about 5 minutes, until softened. Add the ground beef and use the edge of a wooden spoon to break it into pieces. 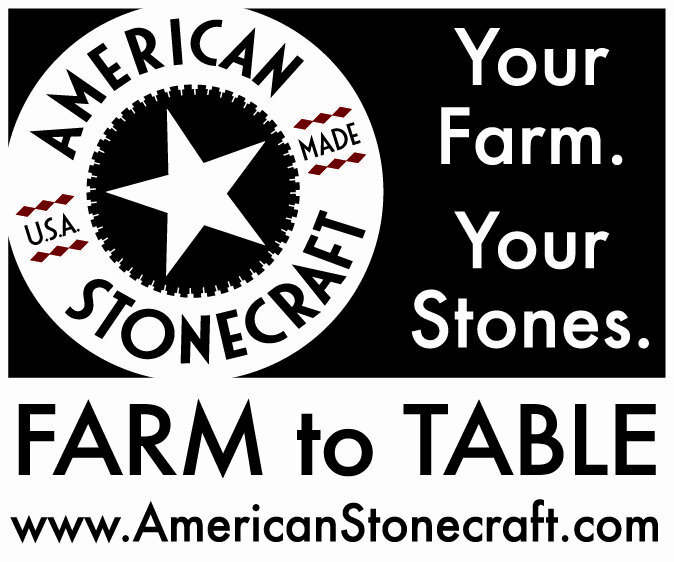 Continue to cook until all the beef is cooked through, stirring frequently so it doesn't burn or stick. Add the breadcrumbs, stir to combine, then add the broth or water and mix until absorbed. Remove the filling from the heat and let it cool. To make the dough, stir together the flour, curry powder, and salt in a large mixing bowl. Add the butter pieces and coat with the flour mixture. Using your fingers, or a pastry blender if you have one, cut the butter into the flour mixture, working quickly until mostly pea-size pieces of butter remain (a few larger pieces are okay; be careful not to overblend). If using your fingers, just rub the mixture together, but don't overwork the mixture or the butter will get too warm and soften too much. Sprinkle in about 1/2 cup of the cold water and gently mix it into the flour with your fingers or a plastic bowl scraper or spatula. Do not overwork the dough. Add the remaining 2 tablespoons of water, or more as needed until the dough just comes together into a ball. Divide the dough into 16 pieces, each weighing approximately 1.5 ounces. Roll each ball between your palms to smooth it out. At this point you can chill the balls of dough for a few minutes if they feel too soft. Preheat the oven to 375 degrees F. Line two baking sheets with parchment paper, and set aside. One at a time, place a ball of dough on a lightly floured surface, press your palm into a ball of dough to begin to flatten it, then use a rolling pin to roll it out evenly into circle about 5-inches in diameter. They may not be perfect circles, but that's ok. 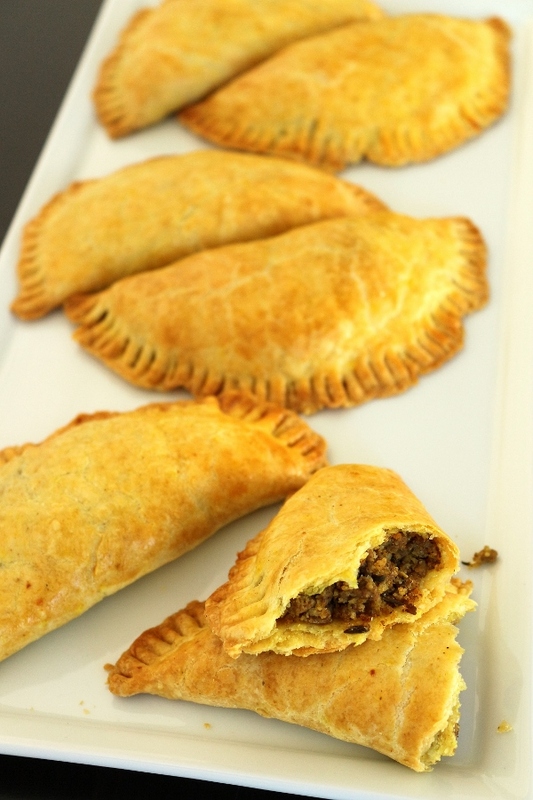 Evenly distribute the beef filling between the dough circles. Don't be too stingy, it will seem like a lot of filling, but you can press and compact the filling a bit to make sure you fill them generously. 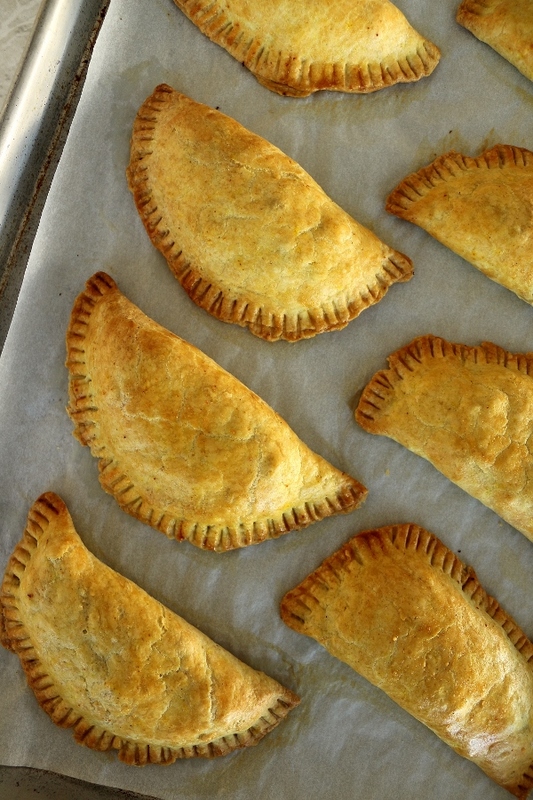 One-by-one fold over the dough and pinch the edges to enclose the filling. Use the tines of a fork to press along the edges to seal. 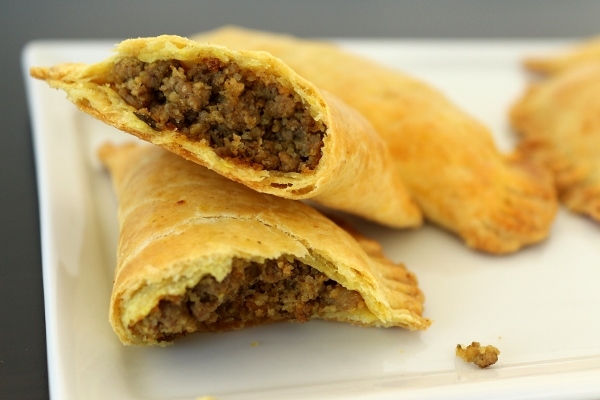 Place the sealed beef patties onto the parchment-lined baking sheets, then chill the sheets in the refrigerator for about 10 minutes to help set the dough (it will bake up flakier if you don't skip this step). Evenly brush the tops of the patties with egg wash, and bake for about 25 to 30 minutes, rotating the pans from front to back and top to bottom, or until golden brown. Serve immediately. 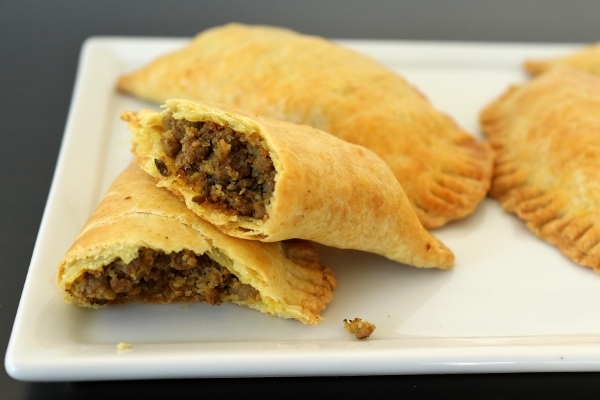 These patties can also be frozen in a single layer and later defrosted and reheated in a 350 degree F oven for about 15 minutes, or until crispy and heated through.